The most sophisticated approach to measuring differences in how states tax business — the representative firm model — addresses many of the problems with examining the average level of business taxes. 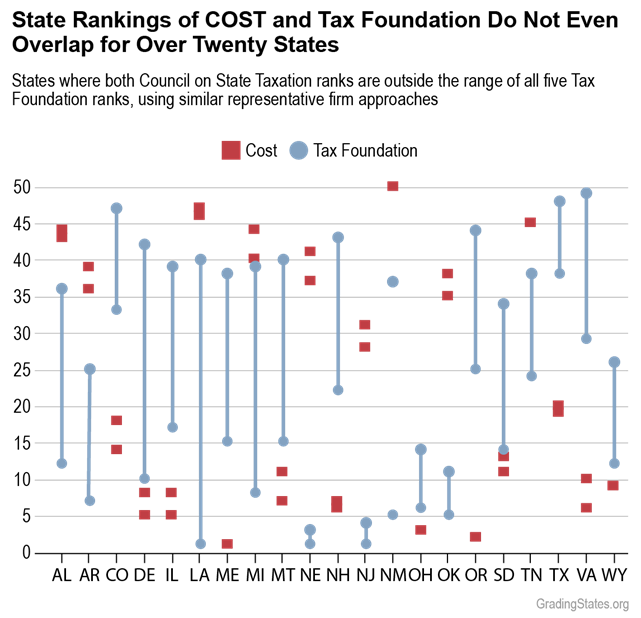 There are two prominent representative firm models produced in recent years: The Council on State Taxation (COST) report Competitiveness of State and Local Business Taxes on New Investment and the Tax Foundation’s Location Matters. These mathematical models allow for more complexity and nuance because they acknowledge that companies and facilities vary greatly in how they interact with tax codes, and they are aimed at measuring how tax systems impact plant expansions or relocations. Unfortunately, both models have serious flaws and fail to take full advantage of the methodology. First, theoretical representative firms are constructed from publicly available information on the financial characteristics of actual firms in particular sectors, primarily sectors that are relatively mobile or able to operate profitably in a variety of geographic areas. Then those firms are subjected to the tax systems of all 50 states. Such models can measure the tax that would be incurred by making an investment—a new plant or a facility expansion—as well as the tax paid by an existing business. The effective tax rates are likely to be quite different for new versus established firms because of the prevalence of economic development incentives tied to new capital investment or jobs. Each of the current representative firm models has significant problems. COST’s model excludes pass-through entities such as S corporation or LLCs, which are very common among small-businesses. And even though it models five different kinds of facilities and three kinds of taxes, it hides those disaggregated results and only provides two blended numbers per state. In a huge omission, it fails to account for tax incentives, even though such subsidies can greatly reduce tax liabilities and thereby affect investment returns. The COST model also assumes every facility sells five percent of its output in-state, whether it is located in, say, California or North Dakota. Finally, it uses the property tax rates of each state’s largest city, which are often far higher than statewide averages. As a result, the COST and the Tax Foundation representative firm findings should be used with considerable caution. The representative firm approach shows considerable promise, despite the flaws of the COST and Tax Foundation models. It explains why crude “one size fits all” business climate ratings have no real-world applicability. In turn, understanding the wide variability of company inputs and costs helps dispel the misleading impressions left by business climate studies that single-variable “silver bullets” can shape something as complex as a state economy. The differences in tax rates among sectors within a given state are often larger than the differences among states for a given sector. We hope that future versions of the COST and Tax Foundation studies overcome the deficiencies noted above. In the meantime, it should give us considerable pause that these two studies, employing the same general methodology and nearly the same economic sectors (with only two exceptions), should come up with such different results due to the differences in the key assumptions made. For example, the COST report’s average tax rates for Nebraska rank it 37th and 41st among the states, while the Tax Foundation’s report shows Nebraska ranks from 1st to 3rd best depending on which of the five representative firms are considered. COST has Oregon 2nd best, while the Tax Foundation ranks it from 25th to 44th. Clearly the results of these representative firm models are highly sensitive to the underlying inputs used to calculate effective tax rates. Given the problems with both studies, serious reliance on them should wait until methodological improvements have been implemented. Finally, it is worth reiterating that even the best possible representative firm model would not provide us the answer to the question: where is the best location for a particular firm? That’s because the answer to this question depends not only on the particulars of a site within a state, but on cost factors that in general weigh far more heavily in the location decision than state and local taxes: differences in wages, transportation access, energy prices, availability of particular skills, sources of inputs, access to suppliers, access to markets.